Access all Kuna, Idaho homes for sale and real estate here. 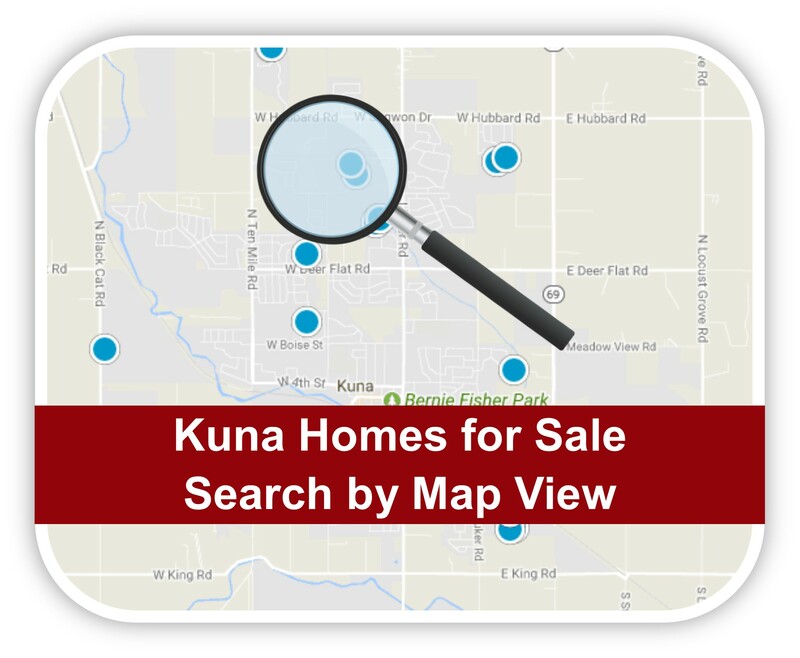 Properties in Kuna are updated daily from the MLS, so be sure to return here for the newest listings for sale in Kuna, Idaho. Kuna, Idaho is the perfect location in the Treasure Valley for those who are seeking that small town feel, without sacrificing some of the big city comforts. With Boise, Meridian and Nampa close by, residents of Kuna have the ability to escape the big city life without having to travel far. Quiet and still somewhat rural, Kuna is friendly and quaint. This fun and safe community is an amazing place to live, and raise a family, regardless of if you are moving across the Treasure Valley, or moving across the country. As one of the handful of towns and cities in the Treasure Valley, Kuna is nestled between Nampa to its west, and Meridian to its north. To the town’s south is the wide open arid-desert, which allows the town to have room to grow, and gives residents a sense of openness and distance from the larger cities in the Valley. Kuna is considered part of the greater metropolitan area of 669,830 people, which includes Boise, Meridian, Nampa, Middleton, Caldwell, and Eagle, but is home to less than 20,000 residents. Thanks to having plenty of room for growth, Kuna is poised to nearly double its size within the next few years. This growth puts Kuna in line to potentially becoming one of the top ten largest cities in the state of Idaho. Currently, Kuna is the 14th largest city in Idaho. Kuna is roughly thirty to forty minutes away from the heart of downtown Boise, and about twenty minutes away from major attractions and shopping centers in Meridian. Kuna has its own unique activities that the rest of the Treasure Valley does not offer, such as easy access to undeveloped land, where residents can enjoy dirt biking, target shooting and exploring for miles on end. Kuna also boasts the Snake River Canyon Overlook, which includes the Canyon River Trail. The trail is a 12 mile stretch that connects the Swan Falls Dam with Celebration Park, and follows the Snake River as it flows towards the Columbia River for a thousand miles across the country. Celebration Park is one of the first archaeological parks in Idaho, where ancient and more recent petroglyphs are etched into boulders. The park also has hiking trails, campsites, and a boat ramp to enjoy the river. Swan Falls is a favorite for those who like to fish for smallmouth bass, catfish and surgeon as well as those who enjoy the many birds of prey who perch and nest in the cliffs. One of the most scenic and historic locations in Kuna is the Kuna Caves. Once created by volcanic activity, the caves now serve as a cornerstone of the town’s heritage and identity. Unfortunately, the caves are no longer open to the public, but the Kuna Caves importance to this community never wavers. Like much of the rest of the Treasure Valley, Kuna experiences mild weather throughout all four seasons, with each breathing new life into the year. Kuna’s average summer high, and average winter low are nearly identical to Boise’s, sitting at 82.2 degrees during the summer and 25 degrees during the winter. The summers in the Valley are typically dry, where the heat can hit upwards of 100 degrees. Winters are normally mild, where light snowfall is common, but mild compared to other towns surrounding the Rocky Mountains. This snowfall allows local snowboarders and skiers to take the drive up to Bogus Basin Ski Resort throughout winter, and is about an hour drive from town. Kuna also enjoys amazing spring and fall months, where the changes in the seasons are abundant and beautiful. The Treasure Valley enjoys over 200 sunny days throughout the year, and Kuna is no exception to it. With nearly all of Ada County and the Treasure Valley experiencing unprecedented economic growth, there are job opportunities to be had across various fields. As the city’s growth continues, there will be increasing opportunities for new jobs and higher demand to fill those positions. Kuna’s primary industry focus has been agriculture, but the effects of Boise’s growing tech industry can be felt in Kuna. Without one dominant industry or business in town, Kuna offers a perfect setting for new businesses to thrive and have room to grow. The unemployment rate in Kuna is slightly lower than the rest of the metropolitan area, and also has one of the best costs of living in the country, thanks to its small size and location.